Jeff was born to work at CD & Power. Well, nearly. We pulled him into the “family” when he was still a teenager. 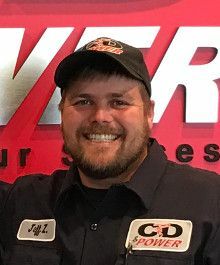 Now, about a dozen years later, he is one of our most experienced generator technicians, working on generator brands like Kohler, Taylor and Cummins/Onan. Having spent the first 22 years of his life right in our back yard (Concord), it was easy for us to get noticed by Jeff. He was already into working on cars & trucks in his spare time, so “wrenching” for a living sounded pretty interesting. He had been fueling airplanes at Buchanan Field Airport when he heard from a high school buddy’s dad about CD & Power (Cal Diesel, as we were known at the time). We were indeed hiring and we all saw his potential – including that “buddy’s dad,” Tod Smith, who became one of Jeff’s mentors and is still one of our leading technicians – so we brought him on board. Side note #1: You too can be mentored by Tod in this video. Side note #2: The “buddy” – Alix Smith – works for CD & Power too. Jeff’s first job was to help our truck technicians and to keep our shop neat and in good working order. “It was like being an apprentice,” Jeff recalls. When truck work was slow, he would help service and maintain our rental generator fleet. Since he enjoyed the electrical aspect, he pursued more knowledge and experience working on generators. In fact, he would put in extra hours just to tag along on a job that one of the senior generator technicians was tackling. He was a fast learner, so we sent him to lots of classes in addition to his on-the-job-training regimen. Within a couple years, Jeff was a field technician himself – out in a truck working on customers’ stationary and portable generators. The history of things coming together at the right time between Jeff and the company is a pattern, it seems. While we have a Sacramento office, our customer base in Central Valley areas to the south has continued to grow. A couple of years ago, as we wrestled with how to provide more timely support to those customers, Jeff mentioned he was looking to move to that area. Voila – we were relieved of making an extravagant plan because the perfect solution fell into our laps. Now over a year later, Jeff services the generators of many of our customers in Stockton, Modesto, and the Central Valley being based out of our Sacramento Branch. “I like having such easy access to good hunting plus boating and fishing on New Hogan Lake,” Jeff describes. “Even though I am away from the main office, I still benefit from the family atmosphere at CD & Power.” We wouldn’t have it any other way, Jeff!